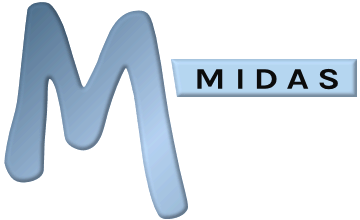 Existing customers running the latest build of MIDAS v4.03 (or later) can add the Web Calendars addon to their MIDAS via the upgrade page. This is a list of all the current web calendars you've defined. To set an existing calendar to be the "default", highlight it in the "Current Calendars" list and click "Set as Default". An asterisk will denote the current "default" web calendar. Lists a number of variables that you can use within your calendar templates. These variables will be substituted for corresponding content in your "live" calendars. Similar to global variables, when field "field" variables are used within your web calendar templates, they are substituted with live data from corresponding booking fields. If you've set the "Action on Click" setting to "Show extended info for selected date in popup" and you wish to use these variables in your Popup Templates, they must all be placed between a single set of <bookings>...</bookings> tags. 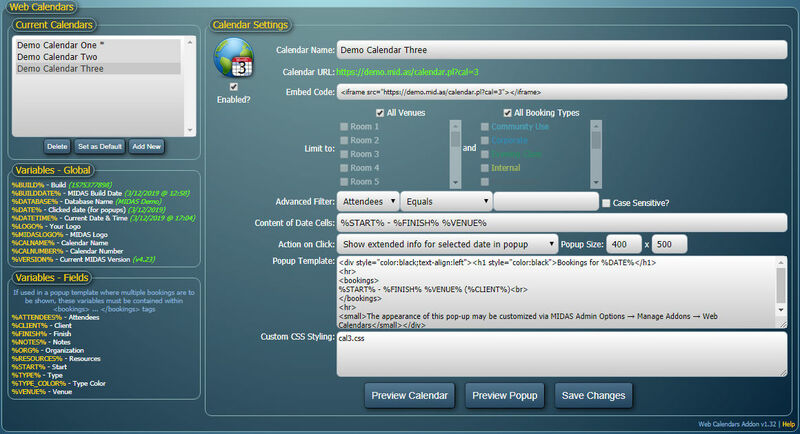 Allows you to "disable" individual web calendars. When a disabled web calendar is viewed it will instead display a "Calendar Currently Disabled" message. The internal number representing the web calendar you are currently defining. A name by which you can use to identify the web calendar you are defining. This name will appear in the "Current Calendars" list and can be shown on your calendar if desired through the inclusion of the %CALNAME% variable within your template. The URL at which your web calendar will be available. The Embed Code will provide you with an example HTML code fragment which you can copy and paste into your web site, using the standard <IFRAME> HTML element, allowing you to "embed" a web calendar directly into web pages on your site. These settings allow you to control which bookings should be included on the current web calendar. By default "All Venues" and "All Booking Types" will be shown. You can "untick" either of these options to limit the range of venues/booking types that are presented on the calendar. Defines how each booking should be displayed on date cells within the web calendar, using the Field Variables described above. For example, setting this value to "%START% - %FINISH% %VENUE%" will translate on your actual calendar to show each booking in the format "08.00 - 09.00 Room 1"
"Show extended info for selected booking in popup" - Allows each booking shown on your web calendar, when clicked, to show a pop-up window containing further information about the selected booking. "Show extended info for selected date in popup" - Allows each date shown on your web calendar, when clicked, to show a pop-up window containing further information about the bookings taking place on that date. When the "Action of Click" setting is anything other than "Do nothing", the Popup Size settings allow you to specify the size of pop-up windows generated when a user clicks a booking/date. For example, setting this to "400 x 600" will produce pop-up windows that are 400 pixels wide, and 600 pixels tall. When the "Action of Click" setting is anything other than "Do nothing", a popup window will be generated when a visitor clicks a booking/date. You can define the content of these popups here. If you've set the "Action on Click" setting to "Show extended info for selected date in popup" any field variables you use in your popup template must be placed within <bookings>...</bookings> tags. This indicates to MIDAS the section of template code that is to be repeated for each booking to be displayed. This field allows you to precisely control all the visual elements of your calendar and associated pop-ups through the use of CSS (Cascading Style Sheets). This field will accept the URL to an external .css file, or (starting from v1.12 of the Web Calendars addon) raw CSS code directly. This button is only visible if "Action of Click" isn't set to "Do nothing". Once you're happy with your web calendar template and settings, click the "Save Changes" button to save your calendar. You can edit the template and/or settings for a previously saved web calendar at any time by simply selecting it in the "Current Calendars" list. You can customize the appearance of your calendars through the use of an external .css stylesheet.